ALBUQUERQUE, N.M. (AP) — Former Sen. Pete Domenici of New Mexico fathered a son outside of his marriage more than 30 years ago with the then-24-year-old daughter of a Senate colleague, the retired Republican has acknowledged. The revelation stunned many who know the state’s longest-serving senator as a family man who advocated honesty. Domenici and Michelle Laxalt sent statements to the Albuquerque Journal identifying their son as Nevada attorney Adam Paul Laxalt. They said they decided to go public with their decades-old secret because they believed someone was about to reveal the information in an attempt to smear Domenici. Domenici and Michelle Laxalt agreed to keep his fatherhood secret because he and her father, Paul Laxalt of Nevada, were senators at the time she gave birth. Michelle Laxalt is a former Capitol Hill staffer who now works as a prominent lobbyist in the Washington, D.C. area. Public records show she is now 58 and her son is 34. Laxalt said in a statement that she chose to raise her son as a single parent. “One night’s mistake led to pregnancy more than 30 years ago,” she said. The Albuquerque Journal reports she worked for several senators, but never Domenici. During six terms in office In New Mexico, Domenici was known for his unflagging support of the state’s national laboratories and military installations. In Washington, he became a power broker for his work on the federal budget and energy policy. He also was an advocate for insurance coverage for mental health. Domenici declined to seek a seventh Senate term in 2008, saying he had been diagnosed with an incurable brain disorder. But he did note that “truthfulness” is the first pillar of good character in a program he helped establish for school children in New Mexico. In his statement, Domenici said he was sorry that he caused hurt and disappointment for his wife and other family members. Domenici is the father of eight children with his wife, Nancy. He said he disclosed the situation to his family several months ago. “I have apologized as best as I can to my wife, and we have worked together to strengthen our relationship,” Domenici said. Domenici told the Journal his son participated in the drafting of his statement. But it was unclear if the two had a prior relationship. 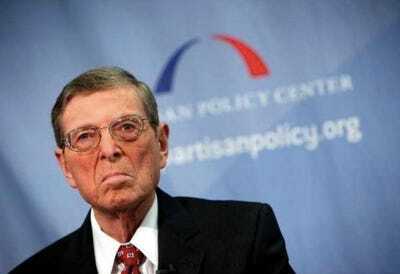 Reached at his home in Washington Wednesday morning, Domenici said he had nothing more to say. The Laxalts did not immediately respond to emails and phone calls seeking comment. The website for Adam Laxalt’s law firm, Lewis and Roca, said he is a former U.S. Navy officer and lawyer who served in Iraq. He also worked for then-Sen. John Warner, R-Va., and as a special assistant to an undersecretary of state, according to the website. Former colleagues said they doubted the revelations would impact Domenici’s strong legacy. “His contribution to our country, to our state, our community, cannot be diminished in my view by personal events,” said former Gov. Garrey Carruthers. Carruthers, who is also Republican, said Domenici called him Tuesday night to tell him the story was coming out. Domenici served New Mexico well and “deserves to be left alone, Democratic Party Chairman Javier Gonzales said. Associated Press writer Russell Contreras contributed to this report.